NAAFA-Clark County Chapter presents the Third Quarter, 2014 Size Savvy Award to Dessy B’s Steakhouse for their service and accessibility to people of all sizes. Darliene Howell with Dessy B staff presenting Size Savvy Award. 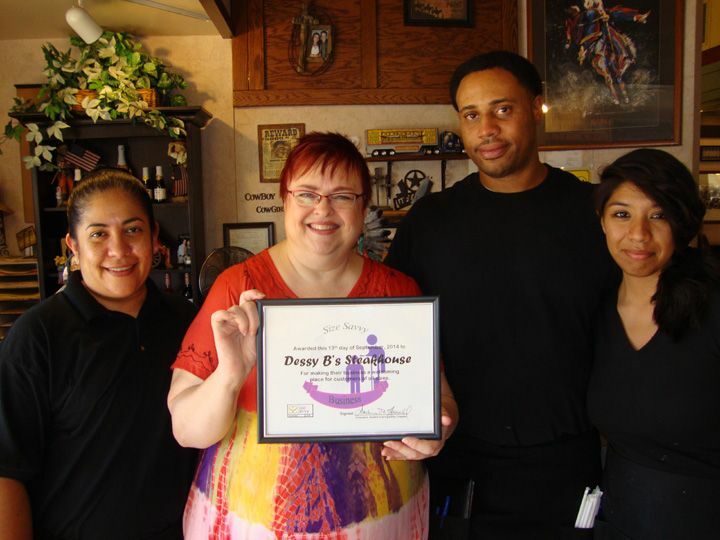 LAS VEGAS - Oct. 19, 2014 - PRLog -- The Clark County Chapter of NAAFA is pleased to announce the third quarter recipient of the NAAFA Size Savvy Award, Dessy B’s Steakhouse. The Size Savvy Project makes information available to the public regarding businesses that are welcoming to people of all sizes. A size savvy business meets certain criteria making it accessible and accommodating and the business staff displays an attitude free of weight bias. Founded in 1969, NAAFA is a non-profit human rights organization dedicated to improving the quality of life for people of large body size. NAAFA works to eliminate discrimination based on body size and provide people with the tools for self-empowerment through public education, advocacy, and member support. NAAFA Conference Scholarship Drive a Success! What's a NAAFA Conference Without Fashion?